OMG I just had the craziest idea of what might happen. David wants Andy to fire Erin but he doesn’t want to. So he talks to her about it and that’s when she tells him about Pete. So Andy goes ahead and changes Erin’s report and tells David it was a mistake. He messes up Pete’s report and fires him. Then he sees Erin sad making him feel horrible. Yay Andy’s back! The Office is not the same without him. I think they could have found a better wig for Ed to wear though. Andy’s hair is so hot. From the episode descriptions, I was pleasantly surprised to find Andy in the photos. It sounded more like he was returning in the “Moving On” episode. I’ll take his hair however it comes at this point. Erin’s pained expression in the first picture makes me sad for her. Another awesome wig for Meredith ! (I wonder if Kate Flannery gets to pick them out herself). So Andy hasn’t quite got himself back together then… He will be at such a low ebb that Erin can’t end it, I would guess. 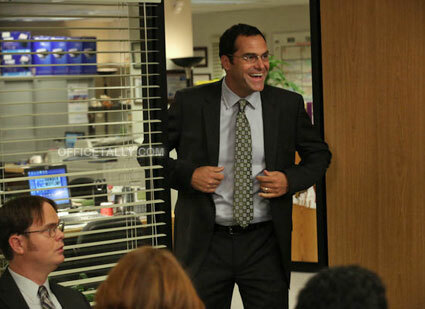 The sight of David Wallace makes me nervous. Please don’t let them fire Andy again. We have already been through that once! LOVING Meredith’s wigs lately….Ed’s, not so much. And welcome back, David Wallace! Finally – David Wallace! I didn’t realize he was on ABC Family’s The Lying Game until just this week – no wonder we haven’t seen him! And he should fire Andy – He has been MIA for weeks. Nelly took his job after just one week last year! @14Josh: I’m with you. Andy deserves to have a happy ending. What if Andy and David Wallace are behind the documentary? We first met Andy when Jim transferred to another branch in Season 3. Do we know how long he worked there before Jim showed up? It’s a theory that might make sense of why Wallace hasn’t fired him yet, and why Andy’s been gone so long. Working to put together the documentary? I am getting seriously concerned that Pam is the one fired!? That would be the reason for her applying for a job in Philly!?! I hope she’s applying in Philly out of support for Jim but it still seems early in the season to already be moving in that direction?! I can hardly wait for Thursdays! !